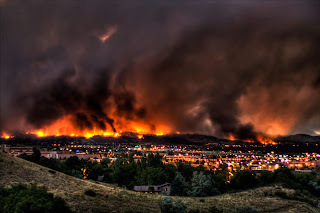 Pictured is a wildfire this summer in Colorado. That made our news. What hasn't made our news are the natural and human-caused wildfires sweeping through Zimbabwe. You can read about those by clicking the link. There is another story on the same topic here. I must say when I wrote this I had not come across the term ecocide. This week a friend commenting on the veld fires alerted me to the existence of the word. Ecocide is the extensive damage, destruction to or loss of ecosystems of a given territory, whether by human agency or by other causes, to such an extent that peaceful enjoyment by the inhabitants of that territory has been severely diminished. There is a whole global movement aimed at stopping the extensive damage to the environment and people’s lives by campaigning to make ecocide the fifth international crime against peace. The ecocide lobby was escalated in March 2010 when Polly Higgins, an international barrister and award-winning author, proposed to the United Nations that ecocide be made an international crime against peace. I have argued that 10 years from now elections in Zimbabwe and the rest of the developing world will be fought and won on the environment. The parties that can articulate their programmes on how to maintain our environment, and hence our own survival as a nation, will come to the fore. In other words environment issues will set “regime-change agendas”. The emergence of Green movements around the globe in the past three or so decades should not be dismissed contemptuously as being of nuisance value simply because their presentations in parliaments is still weak. Their beliefs will begin to come to the fore when the world begins to realise how important the issue of the environment are for the very existence of humanity. Zimbabweans should begin to think in a similar manner. The environment is still a peripheral issue in determining how our country should be governed. This is despite the fact that our very delicate environment is a constant threat to national stability. Let's learn something from Zimbabwe. Living in a correct relationship with the Natural World is preeminently a "political" question.